Yes, it probably looked fine but it just wasn't me. The vase collection bugged me kind of off to the side and I felt like they were a little too modern for me. I bought them at clearance prices and they matched and filled the space but in the back of my mind I was always looking for something else. I finally had the creative ah-ha moment after taking down my Christmas decor, I didn't want the cheap vase collection back up there, ever. Since I really heart cloches and apothecary jars I decided I needed to display them all the time, not just with holiday type items. I finally came across my iron cake stand (I lost it for like 3 months! In my own house!! How's that for being organized?! I had stuck it in a bin of kids clothes that I was carrying up from the storage room in the basement, then I took out the clothes I needed and left the cake stand, who looks for a cake stand in a bin labeled "boys clothes"? Yes, I am crazy). I decided to leave the almost too modern plate because it needed something else and it matches really well. I am so much happier with the new look, (although the burnt orange lampshades still sort of bug me, it needs the color). I used everything that I already had around the house (no $ spent = bonus points!) and I'm so much happier with it. Don't forget to enter my Reedmor Jewelry giveaway here! Like it, especially with the pear tie-in...maybe spray the lamp another color, bronze or rusty?? And would bigger shades make it more dramatic or what? Am really digging cloches and all of the stuff that you can stuff under them..great job! Looks lighter and prettier. Love the glass cloches...what better place to find them than in a junk bin? Oh I love it! It looks so much better after! In my house - I would be thrilled to have the before, and have my house decorated that pretty, but the after is wonderful! Very nice. The new display does seem to be a bit more your 'style'. Looks great. 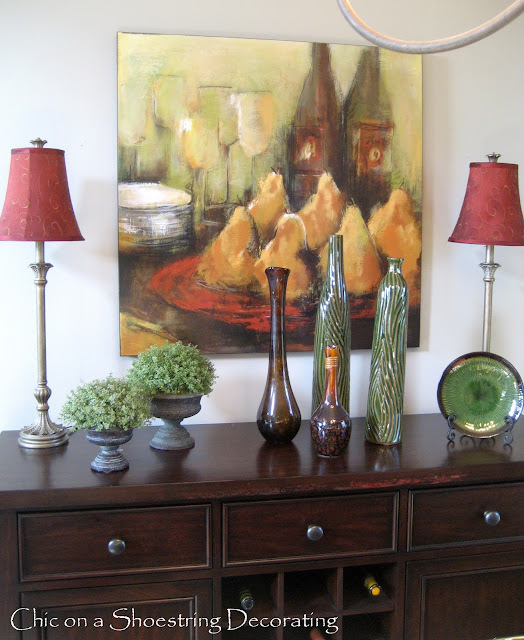 Yes the new look is soooo much better, the other yes modern pieces, but a classic setup, you know lamps vases and a painting. The new look has style, I Love it! I was wishing for some inspiration for my buffet, so thanks for inspiration :) May we see also a dinner table decoration for this buffet :)Regards. Very pretty. My buffet has a computer and printer on it! UGH!!!!! Oh these look so pretty.I think I like it a lot better even though the other looked nice also. I'm going to buck the trend; I think there are too many cloches here now. I like the one with the pears, and the tassel is a nice, soft touch. I agree that the vases were too modern, but now it's too glassy. How about keeping the one with the pears and putting back the urns with the pretty greenery, sans cloches? And push everything a little closer together. That cheerful green plate looks a little orphaned on the side. The new items on display are wonderful. Loving how they appear to be more lively! Hi Kate, I am your newest follower. I love the decor on your buffet ~ I am a huge fan of Apothecary jars and cloches. Love your site I will definately be back often!!! This looks so lovely. I look forward to you stopping by at My Dream Canvas:-)I am a follower!! I am with you...I love, love, love cloches and apothecary jars! This is beautiful and very put together! BTW, I think the lamp shades pick up the color in the pear painting. I love pears too! I like the after better. But then I'm a cloche-a-holic. I loved the story of where the iron cake stand has been hiding out. Sounds like something I would do. Found you on Tatertots & Jello. I like your stuff! I'm following, check me out, I'm new. I love the cloches and apoth. jar. It looks wonderful. Why don't you spray paint the vases? You could do them white or a pretty soft blue. You could use them somewhere else in your house. I love the new design...just a thought... remove the lamp on the right, move the tallest cake stand over w/ the wider one. Move the green plate to the right of the pears (almost in the center of the buffet?